It has been awhile, hasn't it?! This spring is not only flying by, but is proving to be a real time of change for us, in both good and challenging ways. The biggest of those being an inevitable season of military life on the horizon, which will mean extended time apart from one another...a transition full of all sorts of mixed emotions. It's not something I'll be sharing here when that day comes, but it has given me a lot of pause lately (& sometimes a breather is just best!). However, there have been lots of creative happenings as well, including a bridal shower for my life-long best friend. I made a whole slew of branch-and-tissue paper leaves, envisioning a "mini forest" along the tables (and in true form, left the main box of them at home...agh), but we made do with the few that safely arrived. I forgot to take a single photo that day, but I have a few from the planning stages and will share a little recap of the details soon! Cute idea for the tables! I bet everything turned out beautifully! Sending good energy your way for strength during your transitions... Life can be quite challenging sometimes. Claudia, thank you. Your outlook & attitude always inspire me! Mary, thanks for your kind words! So, this is strange that I think I "know" each of these commenters: Alli, from this space that I found a few years ago, which brought me to Mary (if this is Ms T&FS), now a dear, dear friend, who introduced me to Claudia! Thanks for such inspiration--and I love following glimpses into your beautiful perspective on the world in instagram! Best of luck in the midst of it all, and peace, too. aw, i'm glad you have a great attitude and outlook in the midst of your pause..
Leslie, I love the connection you made! I so admire both Claudia & Mary, but oddly enough the commenter above is a different Mary...Ms T&FS is a huge support though & emailed me privately about this post. So glad to hear from you, it made my day. Missed you lady!! I can't wait to see everything you've been up to. I'm sorry it's been a little rough as well, but you sound like you're doing things right and taking a little bit of time for yourself. Everything will work out better in the end, it always does!! I love the mini forest, and also how you created these for your friend. That is so special and wonderful. I cannot imagine how difficult military life must be with so much time apart. You must truly hold each other close in your hearts to go through this day to day. Enjoy the spring and all the good things that are coming. Spring has been very transitional for me as well. Though sometimes it seems spring is meant to be that way? Time apart is never fun, though. 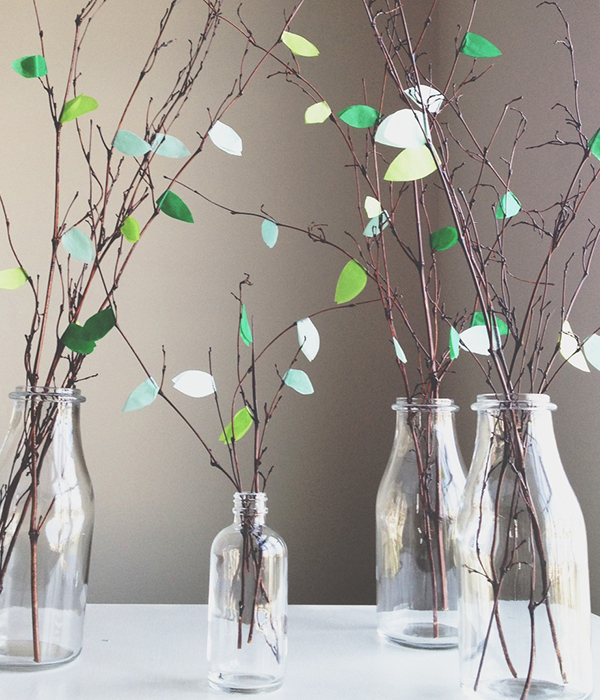 These branches are incredible-what a sweet idea for your friend. And I wish you strength and joy and patience during Q's time away. Such a pretty little forest! I hope you can find peace and strength while apart.